Heard a lot about Berkey's range of water filter systems but unsure where to go next? We take a close look at the most popular models and decide which is best in a range of scenarios. If you’re worried about contaminants in your water, you’re probably looking for a water filter to get rid of pollutants and heavy metals. Public water system crises have been in the media over the past few years, and while there may not be any obvious contaminants of pathogens in our water supply, there are still many chemicals which can be harmful to our health such as chlorine, residue from pesticides and fluoride. What Sort of Water Can it Handle? What Kinds of Contaminants can it Remove? What Steps Should I Take Before Buying a Water Filter System? 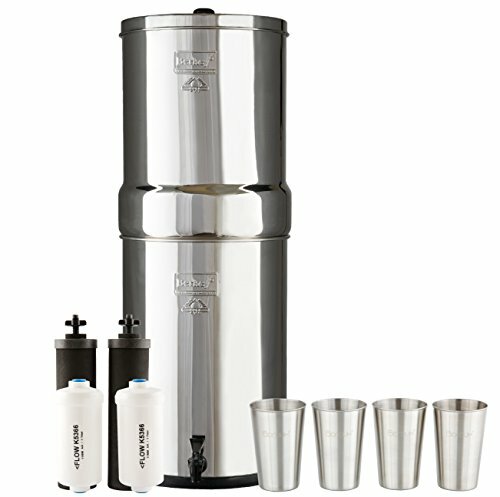 Should I Buy a Berkey Water Filter? Even when you’ve decided that a water filter is the way forward, it can be difficult to plough your way through all the many brands out there. Common sense dictates that not every water filter is created equal, and if you’re determined that only the best will do, that’s a lot of extra work you’ll need to put into reading reviews and researching quality. If you’ve begun your research, you’ll no doubt have already heard of the Berkey water filter. These water filtration systems are ranked among the top performers on the market today and they are extremely popular among homeowners. With this in mind, we answer all your questions about this filter range and save you the effort of reading countless Berkey water filter reviews. Read our buyer’s guide today and find out everything you could possibly need to know about choosing the right water system for you. See how the top Berkey systems compare in the table below. You can read about the the specific contaminants that they remove and also about the maintenance procedures in the reviews and buyer's guide that follow. Learn about each system in more detail now as we discuss all the features that make these models stand out in a crowded marketplace. If you read any Big Berkey water filter review you’ll no doubt see straight away that customer satisfaction levels are high. Big Berkey reviews point out the attractive stainless steel shell of this impressive water filter, as well as its ability to filter out bacterial up to a 99.99999% level as well as viruses to a level of 99.9999%. The black filter can remove chlorine as well as MTBE’s, lead and heavy metals up to a level of 95%. Meanwhile, the PF-2 filters also remove arsenic and up to 95% of fluoride. Being able to target fluoride in water is a major selling point with these systems. Fluoride is notoriously difficult to remove in significant quantities and these filters do it really well. The Big Berkey, like others in this range, is gravity fed. This means there’s no need for a complex water hook up or any kind of plumbing for complete convenience for homeowners. The black filters also have an impressively long lifespan of 3000 gallons while red dye testing is possible to determine which filters require replacing, eliminating the need for any kind of expensive water test. Being gravity fed like this may be a bit of a pain for some as you'll have to fill the system with water yourself. However, this also means that it works completely independently of your household water supply. This makes it portable and also able to filter water from other sources. This could be a real benefit in times when your water supply might not be working properly for whatever reason. This model is the most popular of the range and is perfect for families of more than three people thanks to its maximum capacity of 2.25 gallons. Producing clean tasting water much more rapidly than a pitcher filter system, the Big Berkey requires no electricity and comes complete with two black Berkey filters for immediate use and simple setup. A four-pack of stainless steel cups come supplied with the Big Berkey for even better value for money. Bottom Line: Overall, the Big Berkey is the perfect choice for small to mid-sized family homes. Removing harmful chemicals and contaminants very effectively, its stylish stainless steel exterior makes it an attractive addition to any countertop. The Berkey Light water filter system is capable of holding up to 2.75 gallons of water. Its Earth filters are made using natural diatomaceous earth together with granulated activated charcoal. They are more effective than natural ceramic filters and offer the same level of high performance as the black filters. The Berkey Light is particularly effective for use with well water, and features a water system composed for four separate parts. The base is at the bottom with a middle chamber to hold filtered water, a top chamber holding up to 4 filters and a blue cap lid. This system is also compatible with a set of LED solar powered lights for an attractive look at night. The Berkey Light comes complete with two filters, however it’s possible to buy two more to make a total of four. While the filtering process is effective with two filters, it is quite slow. With the addition of two more, the process is sped up considerably. Thanks to the transparent exterior, it’s possible to easily view the water line to see how much water is already filtered. Meanwhile, the water has a delicious, clean taste. Bottom Line: Overall, the Berkey Light is recommended for families who want the easy and convenience of a transparent unit. While it isn’t as attractive as the stainless steel model, it is an effective choice for any home. The Royal Berkey boasts a water capacity of 3 gallons and features a stylish stainless steel exterior for extra aesthetics in your kitchen. 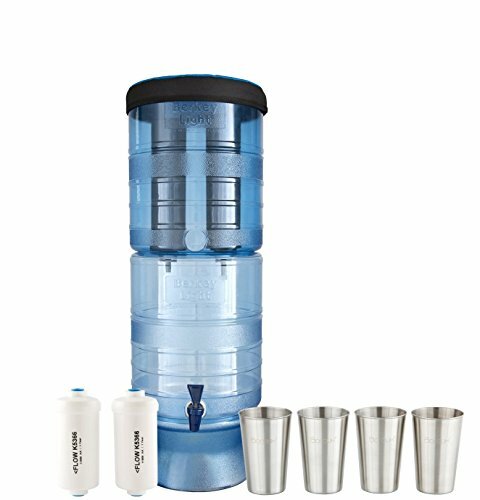 It comes complete with two powerful black water filters as well as a set of PF2 fluoride filters and four 12oz stainless steel drinking cups, representing amazing value for money. Berkey reviews point out that this model is the second most popular of the range, and it is recommended for families of five or bigger. This model is capable of providing delicious, clean-tasting water much faster than a pitcher model and as it requires no electricity thanks to its gravity-fed design, it is a really convenient choice for any countertop. The powerful filters supplied with this model remove over 99% of all bacteria and viruses while keeping the healthy minerals that your body needs. Every filter is capable of filtering as much as 3,000 gallons of water for long-lasting value. Bottom Line: Overall, if you have a larger home and family, the Royal Berkey is the perfect choice for you. Stylish enough to keep out on your countertop, it produces excellent results and comes with everything you need to get you up and running. If you need a water filter system which is capable of supplying the water needs of the largest families and groups, the Crown Berkey perfectly fits the bill. Suitable for water filtration for ten people or more, it produces clean-tasting, fresh water quickly and conveniently thanks to its gravy-fed system. The Crown model comes complete with two black filters and it couldn’t be simpler to set up and use. Compatible with all kinds of water from tap to well, this model is capable of removing as much as 95% of fluoride from your water as well as over 99% of other harmful heavy metals and contaminants. A four pack of stylish stainless steel cups come complete with this model representing even better value for money. Bottom Line: If you’re looking for a Berkey filter review for a product that meets the needs of the biggest families or workplaces, the Crown model will tick all your boxes. Stylish, modern and highly efficient, it’s the perfect option for large-scale operations. When you want complete peace of mind that the water you drink at home will be free of any harmful contaminants and pollutants, a Berkey water filter system will give you the reassurance you need. Read any Berkey water filter review and you’ll find that in most cases buyers are extremely impressed with all four of these systems for their effective functionality and stylish good looks. Choosing a water filter system isn’t always easy, but you can rest assured when you choose any of the four models suggested here you’ll benefit from delicious-tasting, clean water as well as long-lasting value for money. However, if you need a little more guidance, we would recommend the Big Berkey as the best choice for most family’s needs. Capable of providing fresh water for small to mid-sized family units, this is the most popular product in the range. With its impressive performance, attractive stainless steel appearance and spacious water capacity, it’s a great way to ensure your own water supply is as clean and contaminant-free as possible. If you’re interested in buying one of these water filters, you probably have a number of questions before you make your final purchasing decision. It’s important to know the answers to questions such as “how long do Berkey filters last?” as well as knowing about any potential Berkey water filter problems which could arise. Here we look at the most common Berkey water purifier complaints as well as the benefits of choosing one of these water filtration systems. This range of water filter systems all function in an identical way, however they have subtle differences when it comes to the way in which they’re used. Unlike other types of filter system which require connection to the house plumbing system, these units are independent, free-standing units which are placed onto the countertop of your kitchen and filled up with tap water. The water is gravity fed through the filter with the resulting clean water being delivered via the spigot in the device’s base. Most buyers are very happy with their filter systems however some people find it irritating to have to top up their systems manually with water. They also sometimes find that their water filter system takes up a lot of countertop space, especially in the case of the larger models. A further issue for some is the running costs associated with buying multiple filters for the larger models. 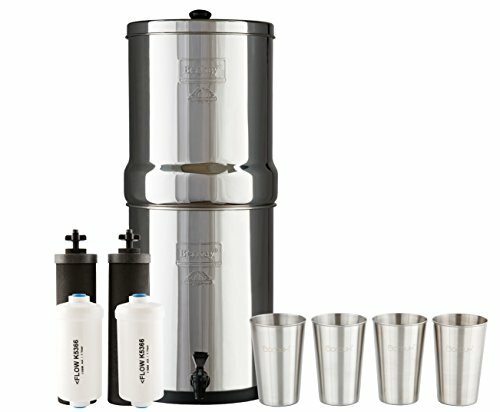 There are two filters in the Berkey range. The black filter comes supplied with every model and has to be used. There are also optional arsenic and fluoride filters. The black filter contains a matrix of microscopic pores which microfilter the water. It removes mercury, lead and other heavy metals. Each filter lasts for around 3000 gallons of filtration use which is an impressive lifespan representing amazing value for money. If you use more filters, you can prolong that lifespan even more. Using 4 filters rather than just the two supplied gives up to 12,000 gallons of filtration use before a replacement is required. The arsenic and fluoride reduction filter can also be used with a black filter. It is hard to remove arsenic and fluoride from tap water and this is why the filter is so impressive. It is rare to find this kind of functionality in a countertop unit. When this filter is used the filtration process is slower and there is a shorter lifespan of just 1000 gallons. This type of filter uses activated alumina to target arsenic and fluoride in the water. Using adsorption, the potentially harmful particles are removed from the water. Unlike other water filter systems, the filters are gravity-fed. This means that gravity forces the water through the filter from its top to its bottom with no artificial pressurization. The long length filters and the water remain in contact for long periods to capture contaminants more effectively. Contact time is the key when using filtration methods such as absorption and adsorption. A Berkey water filter is ideal for use with all kinds of water. Whether you have a well or whether you have city water, you’ll find that these models produce excellent, contaminant-free, tasty water. However, a Berkey filter is even more impressive than that since it can filter untreated water too. If you want to take it camping, for example, you can even filter lake water through it to produce safe drinking water. There is only one kind of water which cannot be filtered – salt water as it corrodes the elements of the filter. Black Berkey filters remove or reduce pathogenic bacteria, cysts, parasites, viruses, trihalomethanes, pharmaceuticals, inorganic materials such as chlorine, VOCs (volatile organic compounds), heavy metals, sediment and rust. They also remove odors and unpleasant tastes. The fluoride/arsenic filter is optional and can remove pre-oxidized arsenic III and arsenic V, fluoride, heavy metals and MTBE. However, unlike many of its rivals, it will not remove any of the beneficial minerals found in water, so you can be confident that you’re choosing a filter system which will produce great tasting water too. These filter units are low maintenance with infrequent filter changes which can be accomplished quickly and easily. The black filters last a very long time – often years – however over time they eventually clog up causing a reduced rate of water flow. The filters can be cleaned using a dish scrubber to scratch the outer layer away from the filter. Once this has been removed, the water will flow properly again. Towards the end of the lifespan of the filter, you should test how effective it is. Since there is no warning light or other indicator to suggest when the filter has reached the end of its life, you will need to carry out some simple tests. One way to test the effectiveness of the filter is to add some red food color to the water. This way, you can see easily if it can pass through the filter. If the red color goes through, it is time for a filter change since a fully functioning filter is capable of taking even coloring out of water. It’s recommended to try this test process once every couple of months to keep your system functioning at optimal levels. Before you buy any water filtration system, there are a few things that you should bear in mind. Firstly, you should always test your tap water. This is a key step when it comes to choosing the best water filter for you. If you’re using a Berkey filter as your primary filtration source, you’ll need to ensure you’re targeting the most appropriate contaminants. Fluoride filters will only be required if you use a city water supply since there is no fluoride added to well water. There may be other pathogenic bacteria, contaminants and harmful chemicals in your water which affect its taste. These can be removed by most water filters, however many of their rivals also remove beneficial minerals which are actually good for your health. Therefore, a Berkey model is a good choice since it will leave the good minerals intact to help improve your well-being. You should also estimate just how much drinking water your household is likely to require. All of the Berkey water filter models are pretty similar, however they are suitable for different sizes of household. The size of the model will also dictate the number of filters which you’ll require. If you’re not sure which size to try, always go for a larger one than you expect. Remember that the average person will consume around 0.85 gallons of water per day. The Royal Berkey is the most popular choice, holding three gallons. Meanwhile, the Travel Berkey is the smallest, holding only 1.5 gallons. When working out how much water you’ll need, it’s best to take half a gallon per day for each member of the household as your rule of thumb. This is only under normal circumstances, however. If you are very active or if the weather is extremely warm, you’ll need more than this amount. If you’re also planning on using filtered water to cook with, that will also need to be borne in mind when figuring out how much water you use per day. Not only that, but you’ll also need to think about preparing for any emergency situation such as a natural disaster. In an emergency, you’ll require at least two gallons of clean, safe drinking water every day for personal hygiene, cleaning and drinking. There are six models in the filter range, each holding different capacities of filtered water. Each filters water at different rates too and this will vary depending on how many filters are being used. Each model is supplied with two black Berkey filters but every model except the Travel Berkey allows you to add extra filters to speed up the flow rate of the water. If you’re keen to filter water as quickly as possible, you should choose a model with more filters. The amount of time each model takes to filter one gallon of water relies on several factors including filter condition, the amount of filter elements in the system and how much water is in the chamber. You can keep the chamber filled with water to speed the filtration process since the amount of pressure is increased and this forces water through the filter more rapidly. The third thing to bear in mind is the amount of space you have available in which to store your water filter system. How much countertop can you dedicate to water filtration? If you have a small kitchen, you’ll need to ensure you have adequate space for a larger model, or you’ll need to opt for a smaller version. Also, remember that you will need to fill up the unit yourself with tap water. This means you should have sufficient countertop space close to the sink to make this as quick and convenient as possible. If you’re in doubt about which system to buy, the Big Berkey may be the most sensible choice since it’s the middle-sized option. Suitable for most smaller families, it’s an ideal solution to getting rid of all the unwanted contaminants in your water. With all of this in mind, you now have all the information you need to make an informed purchasing decision regarding the right water filter for you. 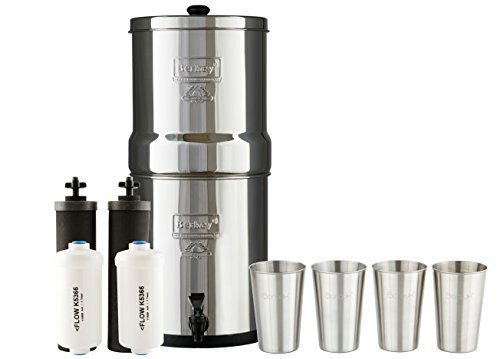 In conclude, if you’re looking for a powerful countertop water filter which requires no complex connections to your plumbing system, which is simple to use both in the home or while traveling, and yet which is capable of removing all of the harmful contaminants from the water effectively, one of the Berkey water filters that we’ve suggested here will be absolutely perfect to meet your individual needs. Check out some other countertop water filters in our reviews of the APEX and Aquasana competition. If you have any questions about anything you've read here then be sure to get in contact down below. We promise to reply promptly. Check us out on social media where you can can see more articles like this on a regular basis.